For other uses, see Cochise (disambiguation). Cochise (/koʊˈtʃiːs/; in Apache: Shi-ka-She or A-da-tli-chi - "having the quality of strength of an oak″, after the Whites called him "Cochise", the Apache adopted it as K'uu-ch'ish or Cheis "oak"; c. 1805 – June 8, 1874) was leader of the Chihuicahui local group of the Chokonen ("central" or "real" Chiricahua) and principal chief (or nantan) of the Chokonen band of the Chiricahua Apache. A key war leader during the Apache Wars, he led an uprising against the U.S. government which began in 1861, and persisted until a peace treaty in 1872. Cochise County, Arizona is named after him. Cochise (or "Cheis") was one of the most noted Apache leaders (along with Geronimo and Mangas Coloradas) to resist intrusions by European Americans during the 19th century. He was described as a large man (for the time), with a muscular frame, classical features, and long black hair, which he wore in traditional Apache style. He was about six feet tall and weighed about 175 pounds. In his own language, his name Cheis meant "having the quality or strength of oak." As a result, the Mexican government began a series of military operations in order to stop the raiding by the Chiricahua, but they were fought to a standstill by the Apache. Cochise's father was killed in the fighting. Cochise deepened his resolve and the Chiricahua Apache pursued vengeance against the Mexicans. Mexican forces captured Cochise at one point in 1848 during an Apache raid on Fronteras, Sonora, but he was exchanged for nearly a dozen Mexican prisoners. Beginning with early Spanish colonization around 1600, the Apache in their territory suffered tension and strife with European settlers until the greater part of the area was acquired by the United States in 1850, following the Mexican War. For a time, the two peoples managed peaceful relations. In the late 1850s, Cochise may have supplied firewood for the Butterfield Overland Mail stagecoach station at Apache Pass. The tenuous peace did not last, as European-American encroachment into Apache territory continued. In 1861 the Bascom Affair was a catalyst for armed confrontation. An Apache raiding party had driven away a local rancher's cattle and kidnapped his twelve-year-old step-son (Felix Ward, who later became known as Mickey Free). Cochise and his band were mistakenly accused of the incident (which had been carried out by another band, Coyotero Apache). Army officer Lt. George Bascom, invited Cochise to the Army's encampment in the belief that the warrior was responsible for the incident. Cochise maintained his innocence and offered to look into the matter with other Apache groups, but the officer tried to arrest him. Cochise escaped by drawing a knife and slashing his way out of the tent. Cochise may have been shot as he fled. Bascom captured some of Cochise's relatives, who apparently were taken by surprise as Cochise escaped. Cochise eventually also took hostages to use in negotiations to free the Apache Indians. However, the negotiations fell apart, because the arrival of U.S. troop reinforcements led Cochise to believe that the situation was spiraling out of his control. Both sides eventually killed all their remaining hostages. Cochise went on to carry out about 11 years of relentless warfare, reducing much of the Mexican/American settlements in southern Arizona to a burned-out wasteland. Dan Thrapp estimated the total death toll of settlers and Mexican/American travelers may have reached 5,000, but most historians believe it was more likely a few hundred. The mistaken arrest of Cochise by Lt. Bascom is still remembered by the Chiricahua's descendants today, who describe the incident as "Cut the Tent." Cochise joined with his father-in-law Mangas Coloradas (Red Sleeves, Kan-da-zis Tlishishen), the powerful Chihenne-Chiricahua chief, in a long series of retaliatory skirmishes and raids on the white settlements and ranches. The Battle of Dragoon Springs was one of these engagements. During the raids, many people were killed, but the Apache quite often had the upper hand. The United States was distracted by its own internal conflict of the looming Civil War, and had begun to pull military forces out of the area. It did not have the resources to deal with the Apache. Additionally, the Apaches were highly adapted to living and fighting in the harsh terrain of the southwest. It was many years before the US Army, using tactics conceived by General George Crook and later adopted by General Nelson A. Miles, were able to effectively challenge the Apache warrior on his own lands. At Apache Pass in 1862, Cochise and Mangas Coloradas, with around 500 fighters, held their ground against a New Mexico-bound force of California volunteers under General James Henry Carleton until carriage mounted howitzer artillery fire was brought to bear on their positions in the rocks above. According to scout John C. Cremony and historian Dan L. Thrapp, the howitzer fire sent the Apaches into an immediate retreat. The Battle of Apache Pass was one of the rare pitched battles the Apaches fought against the United States Army. Normally, the Apaches' tactics involved guerrilla-style warfare. Capt. Thomas Roberts was persuaded by this conflict that it would be best to find a route around Apache Pass, which he did. Gen. Carleton continued unhindered to New Mexico and subsequently took over as commander of the territory. In January 1863, Gen. Joseph R. West, under orders from Gen. Carleton, captured Mangas Coloradas by luring him into a conference under a flag of truce. During what was to be a peaceful parley session, the Americans took Mangas Coloradas prisoner and later murdered him. This fanned the flames of enmity between the encroaching Americans and the Apache. Cochise believed that the Americans had violated the rules of war by capturing and killing Mangas Coloradas during a parley session. Cochise and the Apache continued their raids against American and Mexican settlements and military positions throughout the 1860s. Cochise Stronghold, Dragoon Mountains, southeastern Arizona. Following various skirmishes, Cochise and his men were gradually driven into Arizona's Dragoon Mountains but used the mountains for cover and as a base from which to continue attacks against white settlements. Cochise evaded capture and continued his raids against white settlements and travelers until 1872. In 1871, General Oliver O. Howard was ordered to find Cochise, and in 1872 Howard was accompanied by his aide 1st Lt Joseph Alton Sladen and Captain Samuel S. Sumner, and they came to Arizona to negotiate a peace treaty with Cochise. Tom Jeffords, the Apache leader's only white friend, was also present and a treaty was successfully negotiated on October 12, 1872. 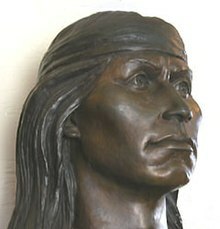 Based on statements by Sumner and descriptions by Sladen, modern historians such as Robert M. Utley believe that Cochise's Spanish interpreter was Geronimo. After the peace treaty, Cochise retired to his new reservation, the short-lived Chiricahua Reservation (1872-1876), with his friend Jeffords as agent. Cochise died of natural causes (probably abdominal cancer) in 1874. He was buried in the rocks above one of his favorite camps in Arizona's Dragoon Mountains, now called the Cochise Stronghold. Only his people and Tom Jeffords knew the exact location of his resting place, and they took the secret to their graves. Many of Cochise's descendants reside at the Mescalero Apache Reservation, near Ruidoso, New Mexico, as well as the Fort Sill Apache Tribe Chiricahua Warm Springs Apache in Oklahoma. It is unknown if a portrait of Cochise exists; a reported portrait of Cochise is actually that of a 1903 Pueblo of Isleta man named Juan Rey Abetia. He married Dos-teh-seh (Dos-tes-ey, Doh-teh-seh – "Something-at-the-campfire-already-cooked", b. 1838), the daughter of Mangas Coloradas, the leader of the Warm Springs and Mimbreño local groups of the Chihenne band. Their children were Taza (1842–1876) and Naiche (1856–1919). The best-selling novel by Elliott Arnold in 1947 titled Blood Brother gives a fictionalized account of the latter part of the struggle and friendship between Jeffords and Cochise. In 1950, director Delmer Daves turned Arnold's novel into a film re-titled Broken Arrow, featuring James Stewart as Jeffords and Jeff Chandler as Cochise. Broken Arrow is often credited as the first sound film to show a sympathetic picture of Native Americans and influenced the popular image of Native American people. The tall, handsome, deeply tanned Chandler, a Jewish actor born in Brooklyn, New York, portrayed Cochise as a noble, nearly tragic character forced to fight against the U.S. Army officers who led incursions into Apache territory. John Ford's representation of Cochise in the 1948 film Fort Apache was also positive to Native Americans, although in that film Cochise spoke Spanish (a language the Apaches had learned from their Mexican enemies). Jeff Chandler again portrayed Cochise in the 1952 film The Battle at Apache Pass. Chandler also played Cochise in Taza, Son of Cochise (1954), with Rock Hudson as his son, Taza The film Conquest of Cochise released by Columbia Pictures in 1953 and starring John Hodiak as Cochise also showed Cochise as a caring man who wanted peace with whites. Broken Arrow was a TV Western series that told a fictionalized account of the historical relationship between Jeffords (John Lupton) and Cochise (Michael Ansara); the show was aired on ABC in prime time from 1956 through 1958. Cochise was portrayed by Jeff Morrow in a 1961 episode of Bonanza. "Cochise" is an instrumental piece in the album "Guitars", by Mike Oldfield. Audioslave's debut single "Cochise" is named after the chief. In an interview, guitarist Tom Morello said that Cochise was "the last great American Indian chief to die free and absolutely unconquered. When several members of his family were captured, tortured and hanged by the U.S. Cavalry, Cochise declared war on the entire Southwest.... Cochise the avenger, fearless and resolute, attacked everything in his path with an unbridled fury." The 2008 novel by Melody Groves titled Arizona War: A Colton Brothers Saga gives a fictionalized account of Cochise's dealings with the main characters, James and Trace Colton, during the early 1860s including the Bascom Affair of 1861 and the New Mexico-bound force of California volunteers under General James Henry Carleton during 1862. Wes Studi portrays Cochise in A Million Ways to Die in the West. A statue of Cochise is shown as a meeting point between friends Jaime Reyes and Tye Longshadow in the Young Justice episode "Beneath." A small lunar crater was named after Cochise, located near the landing site in the Taurus–Littrow valley, by the astronauts of Apollo 17. Phoenix-area theme park, Legend City (now defunct), featured a popular animatronic river ride called Cochise's Stronghold. ^ "Cochise County Arizona". County Website. Cochise County. 2009. Retrieved 2009-09-25. ^ Roberts, David (1993). Once They Moved Like the Wind. New York: Simon & Schuster. p. 21. ISBN 0-671-70221-1. ^ Roberts (1993), p. 22. ^ a b c d e f g Barrett, Stephen Melvil & Turner, Frederick W. (1970). "Introduction". Geronimo: His Own Story: The Autobiography of a Great Patriot Warrior. New York: Dutton. ISBN 0-525-11308-8. ^ Roberts (1993), p. 21. ^ Thrapp, Dan L. (1988). The Conquest of Apacheria. Norman: University of Oklahoma Press. pp. 15–18. ISBN 0-8061-1286-7. ^ Thrapp (1988), pp. 18ff. ^ Debo, Angie (1989) . Geronimo – The Man, His Time, His Place. Norman: University of Oklahoma Press. p. 64. ISBN 0-8061-1828-8. ^ Thrapp (1998), pp. 95–100. ^ Thrapp (1998), pp. 350–51. ^ a b Tucker, Spencer C. (30 September 2013). American Civil War: The Definitive Encyclopedia and Document Collection [6 volumes]: The Definitive Encyclopedia and Document Collection. ABC-CLIO. p. 64. ISBN 978-1-85109-682-4. ^ Roberts (1993), pp. 41–42. ^ Sweeney, Edward R (2008). Making Peace with Cochise: The 1872 Journal of Captain Joseph Alton Sladen. Norman: University of Oklahoma Press. pp. 120–26. ISBN 0-8061-2973-5. ^ Utley, Robert M. (27 November 2012). Geronimo. Yale University Press. pp. 1680–81. ISBN 978-0-300-18900-1. ^ Treat, Wesley; Moran, Mark; Sceurman, Mark (2007). Weird Arizona: Your Travel Guide to Arizona's Local Legends and Best Kept Secrets. Sterling Publishing Company, Inc. p. 211. ISBN 978-1-4027-3938-5. ^ Aleiss, Angela (October 12, 2017). "Is This Really the Legendary Cochise?". IndianCountryToday.com. Archived from the original on November 27, 2018. Retrieved 2018-11-28. ^ Robinson, Sherry (25 April 2016). Apache Voices: Their Stories of Survival as Told to Eve Ball. University of New Mexico Press. p. 77. ISBN 978-0-8263-1848-0. ^ a b Holsinger, M. Paul (1999). War and American Popular Culture: A Historical Encyclopedia. Greenwood. p. 152. ISBN 0-313-29908-0. Retrieved September 17, 2011. ^ Darby, William (1 April 1996). John Ford's Westerns: A Thematic Analysis, with a Filmography. McFarland. pp. 97–98. ISBN 978-1-4766-0752-8. ^ a b McCourt, Tom (2007). Cowpokes to Bike Spokes: The Story of Moab, Utah. Big Earth Publishing. p. 144. ISBN 978-1-55566-396-4. ^ Pitts, Michael R. (2012). Western Movies: A Guide to 5,105 Feature Films, 2d ed. McFarland. p. 68. ISBN 978-0-7864-6372-5. ^ Terrace, Vincent (7 November 2013). Television Introductions: Narrated TV Program Openings since 1949. Scarecrow Press. p. 138. ISBN 978-0-8108-9250-7. ^ Leiby, Bruce R.; Leiby, Linda F. (1 January 2005). A Reference Guide to Television's Bonanza: Episodes, Personnel and Broadcast History. McFarland. p. 52. ISBN 978-0-7864-2268-5. ^ mtv (2002-10-21). "Morello Says Audioslave Have Songs For Second LP Already". MTV. Retrieved 2016-07-27. ^ Groves, Melody (2008). Arizona War: A Colton Brothers Saga. La Frontera Publishing. ISBN 978-0978563431. Retrieved February 21, 2014. ^ "Wes Studi to be Second American Indian Inducted into 'Hall of Great Western Performers'". Indian Country Today Media Network. April 4, 2013. Retrieved May 22, 2014. ^ Apollo 17: Preliminary Science Report. Scientific and Technical Information Office, National Aeronautics and Space Administration. 1973. pp. 5–10. ^ "Legend City – Attractions – Cochise's Stronghold". www.legend-city.com. JPB Publishing. Retrieved 22 November 2016. Bourke, John G. (1971). On the Border with Crook. Lincoln: University of Nebraska Press. LCCN 74-155699. ISBN 0-8032-5741-4. Roberts, David (1993). Once They Moved Like the Wind. New York: Simon & Schuster. ISBN 0-671-70221-1. Sweeney, Edward R. (2008) Making Peace with Cochise: The 1872 Journal of Captain Joseph Alton Sladen. Norman: University of Oklahoma Press, 2008. ISBN 0-8061-2973-5. Thrapp, Dan L. (1967). The Conquest of Apacheria. Norman: University of Oklahoma Press. LCCN 67-15588. ISBN 0-8061-1286-7. Wild, Peter (1973). Cochise. Garden City, NY: Doubleday. ISBN 978-0385057929. OCLC 707537. Robert Schaller (April 23, 2003). "Chief Cochise". Native American Tribal Chief. Find a Grave. Retrieved Aug 18, 2011. Note that the first photo in Find a Grave is actually not Cochise. That photo is a popular one of Chato (Apache) from the Smithsonian's National Anthropological Archives: See Portrait of Chief Chato in Native Dress 1886. Since the photo was taken in 1886, Cochise was long gone (he died in 1874). The second photo in Find a Grave is of Eskiminzin, the Aravapai Apache leader.